Tsatziki – you will never buy a ready made version again! Every Greek will have their own recipe for Tsatziki. I have tried many myself but this version is absolutely delicious so my search has stopped here. 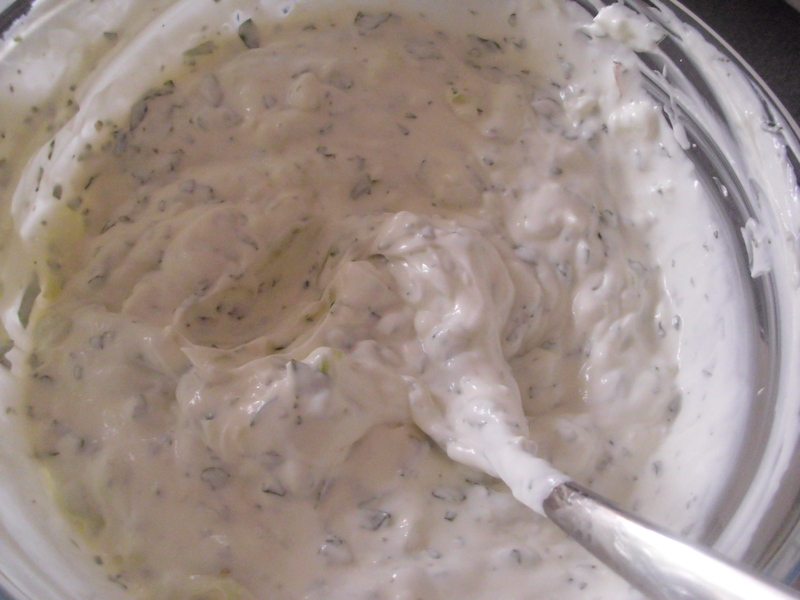 Tsatziki is a Greek dip made from Greek yogurt, mint, cucumber and garlic. It is fantastic simply mopped up with pitta bread for an informal party or BBQ but is also a great accompaniment for meat and salad or with lamb, tomatoes and red onion in a luscious wrap. When it comes to buying Greek yogurt I always buy the Total brand. Even in Greece this is the most popular unless it is homemade of course. FAGE, who produce Total began with their first dairy shop in Athens, Greece, in 1926, which became known for its delicious, creamy, one-of-a-kind yoghurt. This dairy shop was established by the family of Athanassios Filippou, the grandfather of FAGE’s current Chief Executive Officer and Chairman of the Board. In 1954, they created the first wholesale distribution network for yogurt in Greece. By 1964, they opened the company’s first yogurt production in Athens. Until the mid-1970s, FAGE was involved primarily in the small-scale production and distribution of traditional Greek yogurt. Retail outlets typically sold yogurt as a commodity product in bulk quantities, and the consumer often was unaware of the manufacturer. In 1975, they were the first company to introduce branded yogurt products to the Greek market..
From their roots as a local Athens dairy producer, they expanded throughout Greece, as well as internationally. They began exporting yogurt to the United Kingdom in 1983, followed by Italy and many other countries. Exports to the United States started in 1998. Today, consumers can enjoy Total Greek yoghurt in over 35 different countries around the world. Put the yoghurt in a small bowl. Squeeze the grated cucumber in small amounts to remove as much liquid as possible. Add to yoghurt. Add the wine vinegar, olive oil, garlic and chopped mint to the yoghurt and stir to mix well. Season lightly with a little salt and black pepper. Thank you. I have taken a look at your site and there are some great recipes. I am sure I will be trying some in the future. If I like one enough to put on my blog, with a link to your site of course, would that be ok with you?